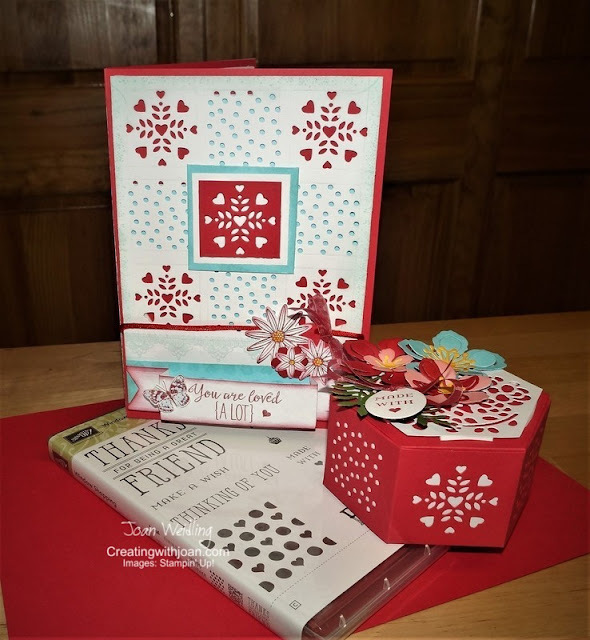 Getting Ready for Valentine's Day with Stampin' Up! Window Shopping! Love is Giving from the Heart! This weeks' DOstamperSTARS Challenge inspired me to get ready for Valentine's Day! So much fun and easy to make beautiful projects with Stampin' Up! Window Shopping Bundle #144753 coordinated with Grateful Bunch #140691 and Blossom Bunch Punch #140612. So, let's get started with the fun! Supplies needed: Window Shopping Bundle #144753, Grateful Bunch #140691, Blossom Bunch Punch #140612, Botanical Builder Framelits #140625, Real Red Cardstock #102482 and ink #126949, Whisper White Cardstock #100730, Soft Sky Cardstock #131203 and ink #131181, Blushing Bride Cardstock #131198 and ink #131172, Wild Wasabi Cardstock #108641 and ink #126959, So Saffron Cardstock #105118 and ink #126957. 1) Cut two Real Red Cardstock #102482 5 x 6 1/2, two Whisper White Cardstock #100730 4 3/4 x 6 1/4 and 1 3/4 x 1 3/4 and 1 x 6, Soft Sky Cardstock #131203 4 3/4 x 1 1/4 and five 2 x 2. 2) Die cut Whisper White with Window Box Thinlits Dies #142762. 3) Die cut and score ends of sentiment tag with Window Box Thinlits Dies #142762. 5) Stamp butterfly and flowers in Real Red Ink and punch flowers with Blossom Bunch Punch #140612. 7) Stamp Soft Sky strip in Soft Sky ink #131181 with Window Shopping Stamp Set #143265 and sponge edges. 8) Adhere four 2 x 2 Soft Sky squares to Real Red Cardstock under die cut Whisper White Cardstock. 9) Adhere punched out flowers to small die cut tag from Window Box Thinlits Dies #142762. Mat small flower with Real Red Cardstock. 10) Inside stamp sentiment and images with Grateful Bunch Stamp Set #140691. 11) Add Real Red 3/8 Stitched Satin Ribbon #141693 to front and attach small tag to ribbon. Sponge edges of die cut Whisper White Cardstock with Soft Sky ink. 1) Die cut Real Red Cardstock #102482 with Window Box Thinlits Dies #142762. Tip: Die cut heart square for bottom panel place up side down so heart is upright when box is constructed. 2) Cut two 1 3/4 x 6 strips of Whisper White Cardstock #100730. Die cut top with Window Box Thinlits Dies #142762. Adhere edges of box with SNAIL Adhesive #104332 or Tear & Tape Adhesive #138995. 3) Die cut flowers from Real Red, Soft Sky, Blushing Bride, Wild Wasabi, and So Saffron cardstock with Botanical Builder Framelits Dies #140625. Sponge edges with corresponding ink. Adhere with Fine Tip Glue Pen #138309. 4) Attach flowers and stamped sentiment tag to top of box. SHOP NOW in the Stampin' Up! Occasions Catalog!